The United Kingdom´s Gold Britannia has been minted by the British Royal Mint since 1987. It appears in four different weights, ranging from 1/10 to 1-ounce coins. Each of the Britannia´s coin weights have a different nominal value, ranging between £10 and £100. 150,000 of the new edition of the Gold Britannia´s are minted every year, meaning that the coin has a global market share of 1% – making it to one of the world´s most popular bullion coins. On its front side it depicts the British Isles. The reverse side shows the profile of Queen Elizabeth II. The Gold Britannia is officially accepted legal tender in the United Kingdom. The bullion coin´s motifs remained unchanged from 1987 to 1996. Since the Britannia´s 10-year anniversary in 1997, the British Royal Mint got back to an initial draft designed by Philip Nathan. From 2001 to 2007, a special Britannia motif was used in odd-numbered years. On its front side, the gold coin shows the Britannia motive and the words "One Ounce Fine Gold Britannia 1987". The classic design of the Gold Britannia shows the inscription "P. Nathan", which indicates a high quality proof edition. The coin´s reverse side shows the portrait of Queen Elizabeth II. Besides the inscription "Elizabeth II Dei Gratia Regina FD", the coin´s nominal value is depicted. Just like in the case of Australian and Canadian gold coins, the Queen´s portrait will be adjusted from time to time. The coin has a gold purity of 91.7% (.917), which corresponds to a 22-carat coin. Britannia coins were alloyed with copper until 1989, which gave the first Britannia edition its reddish colour. In the following years, silver was added instead of copper, which provides the coin with its warm yellow colour until today. The Britannia is available in four different weights of 1 ounce, ½ ounce, ¼ ounce, as well as 1/10 ounce. The 1-ounce coin has a nominal value of £100, which corresponds with the highest face value among all global bullion coins. The 1-ounce coin weighs 34.05 grams and has a gold content of 31.1 grams. The ½ ounce coin has a nominal value of £50 and its weight is at 17.03 grams, offering a gold content of 15.552 grams. While the ¼ ounce coin has a nominal value of £25, the face value of the 1/10 ounce coin is at £10. The ¼ ounce coin weighs 8.51 grams, coming with a gold content of 7.776 grams. A 1/10 ounce coin weighs 3.41 grams and has a gold content of 3.11 grams. The nominal value of the respective coin sizes should not be confused with their real value. The respective coin values are solely dependent on current gold spot prices as indicated by the London gold fix, and nominal values of respective coin weights might be far exceeded by the weight value. The British Royal Mint sells its 1-ounce gold coins at a premium of 3% to global gold traders compared to current fixing prices at global gold markets. The smaller the Britannia´s coin weight the higher the premium, making the 1/10 ounce the most expensive coin version in relation to its intrinsic value. 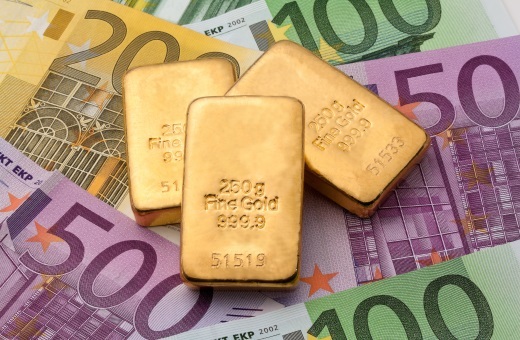 The purchase of gold coins is VAT-free – in contrast to silver coins – in all states of the European Union as well as in Switzerland. In each minting year, the British Royal Mint also produced so-called proof versions of the Britannia. The coin´s proof versions are usually available only in sets of all four coin sizes, as well as in pairs of the two smallest sizes. I think that Estonia is VAT free for legal tender silver. "The Britannia is available in four different finenesses of 1 ounce, ½ ounce, ¼ ounce, as well as 1/10 ounce." You all need to proof read before you post. All have the same fineness of .917.